Archaeology seems to be a bit of a bug, you get it and it holds onto you. I got interested in archaeology at a young age, living in North Sligo, an area overflowing with archaeological sites. In Primary school we were exposed to some of these ancient sites such as Knocklane Promontory fort, and at home we had a “fairy stone” on our land. These things certainly had to have played a part in inspiring me to want to learn more. Fig. 1: Knocklane Promontory Fort, Co. Sligo. In Secondary School, the career guidance meetings with me were very short, and I knew pretty well what I wanted to do, something that was perhaps not the most economical of moves at the time, but one which is interesting, and something where there are endless opportunities to discover something new about something old. I got my first choice on the CAO in 2012, the BSc Applied Archaeology Course at IT Sligo; a Science degree in Archaeology with an emphasis on the practical side. As a straight-from-school student it was quite daunting to be entering the higher-education world, but my great classmates and fantastic lecturers made it an easy transition. In my class there was a mix of straight-from-school students and mature students with a few in-between. Though strange to be at college with people of an older age, we all got on really well, and in my opinion having people coming in from different backgrounds only enhanced the experience. I had initially applied for the three year degree, though IT Sligo offer a two, three or four year Applied Archaeology degree, and you can opt to carry on after completing each if you so decide. I decided to continue to complete the fourth year for the added three letters after my name. The final year comprised of nine taught modules and a final year project or thesis worth 30%. This blog post is to tell you a little bit about my final year project. The project idea first came about after an exciting lecture by Sam Moore (lecturer in Prehistoric and Digital Archaeology at IT Sligo) in which he introduced the class to various online maps, and aerial imagery. I spent some time at home after this class just looking at the area around where I live in North Sligo on aerial and historic maps and soon found what looked to be a cropmark (Fig. 2). After a quick cross-check with the National Monuments Service online data viewer I was surprised to see it was not a Recorded Monument. Fig. 2: Aerial view of the site from Bing Maps. It was remarked to me by a lecturer that it would make an interesting fourth year project, and this coupled with the fact that I grew to really enjoy geophysics and landscape archaeology inspired me to actually use it as my fourth year project. My project was supervised by Dr. Fiona Beglane who was a fantastic help in putting my plan into action and keeping me on the straight and narrow. My initial thoughts of the site were that it was possibly a moated site due to its sub-rectangular shape. A moated site as some of the more seasoned archaeologists among you will know includes all rectangular or sub-rectangular earthworks, which are bounded by one or more series of moats with an internal bank (Barry 1987, 84). In Ireland they are predominantly located in Wexford, Kilkenny and Tipperary with smaller concentrations in other parts of the south, west and north-west (O’Sullivan and Downey 2006, 35-36). However, one distinct feature of the site was what appeared to be bastions on the remaining corners (the other two presumed to be eroded by the sea) which always clouded my opinion. There are a couple of examples in Ireland of moated sites with bastion corners including Knockbeg West, Collooney, Co. Sligo (Fig. 3) which has the remains of two bastions on its landward side, the north-west side utilises the Owenmore river, with the bastions thought to be contemporary with the original moated site (Barry 2003, 182-184). Fig. 3: Knockbeg West Moated Site, Sligo (Barry 2003, 183). The sites location is also not the norm for moated sites, as they are usually located in lowland locations, where the moats naturally fill with water, whereas in this circumstance it would be nearly impossible to flood the ditch, as the water would drain out naturally to the nearby sea. The site was also noticed by my neighbour, Mr Leo Leydon (Past president of Sligo Field Club) and between myself and Leo both reporting it to the National Monuments Service it was subsequently visited by Jane O’Shaughnessy and recorded as a Bastioned Fort (RMP: SL007-052----). This obviously differing from my original thoughts led to the main aim of my project. The main aim of my project was thus, to determine the site type using both geophysical methods, as well as looking at its historical background, land-ownership history, location in the landscape, comparison with other similar sites and land-regression analysis. The culmination of all this research making up the 12,000 or so words of my thesis. In this blog I will give an overview of the project and the findings. The main aim of this study was to define the site type. It was initially thought to have been that of a moated site, until the National Monuments Service classified it as a Bastioned Fort. 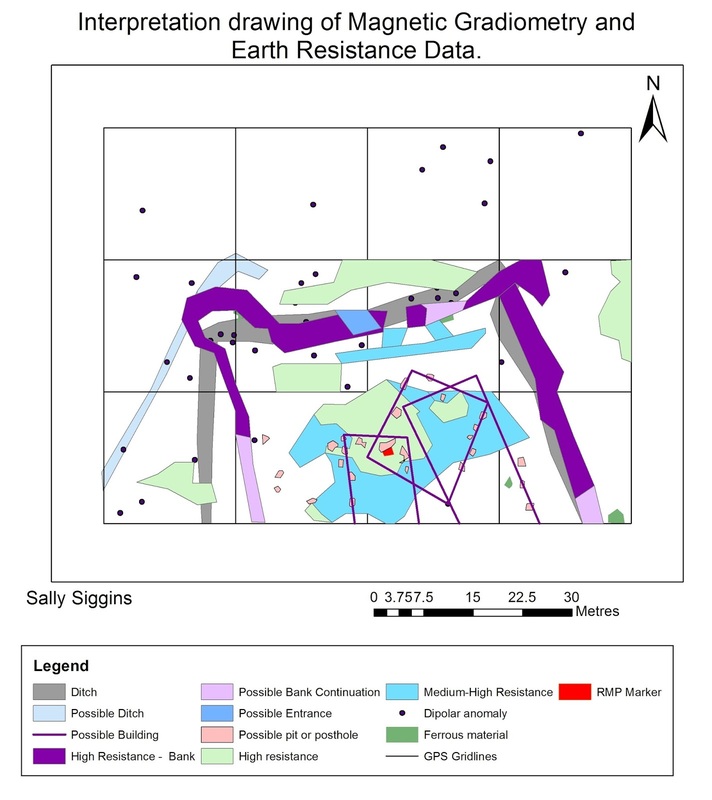 The main research to help characterise the site was the geophysical survey. Both magnetic gradiometer and earth resistance surveys were conducted with the assistance of my classmate Ciarán Davis and volunteers from year two and three of the Applied Archaeology course (Fig. 4). Fig. 4: Sally conducting the magnetic gradiometer survey. The surveys resulted in two different data sets, both examining different aspects of the site. The magnetic gradiometer survey was used to look for the magnetic properties of the ground, which can be particularly useful when looking for ditches, pits, post-holes and ferrous objects (Schmidt, Linford, Linford, David, Gaffney, Sarris and Fassbinder 2016, 43). Earth resistance works on the principle of how hard it is to pass an electric current through the ground, and thus shows up masonry, walls, and other features particularly well (Schmidt et al 2016, 43). Through the surveys conducted the main features detected were the rectilinear ditch in the magnetic gradiometer survey and a similar shaped bank in the earth resistance survey, these are thought to correspond with the cropmarks on the aerial imagery. This is the main morphological feature of the site, and thus is the basis of defining the site type. Figure 5 shows both sets of data interpretation drawings overlaid. 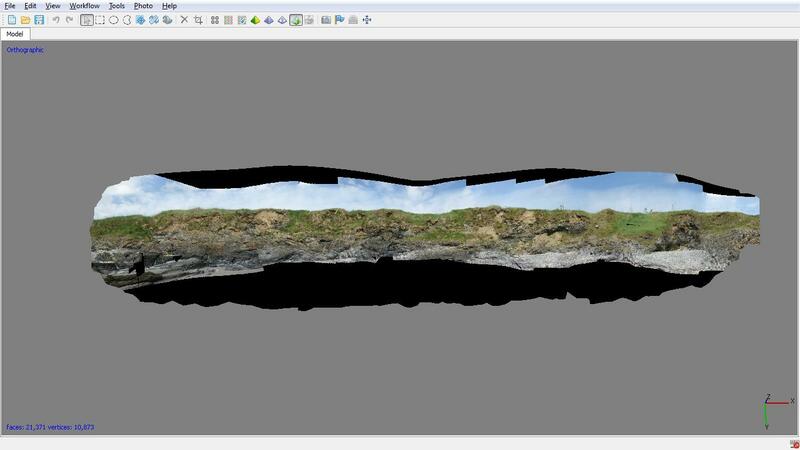 The ditch and bank do not line up perfectly, this is most likely due to digitally fixing the earth resistance data which had been slightly messed up in the field due to operator errors. Thus the earth resistance data may have moved somewhat through the computer processing procedures. However, mainly the ditch does appear to be outside the bank, which would mean that the site had an external ditch and an internal bank, a characteristic of both moated sites and bastion forts (Barry 1987, 93; Kerrigan 1980, 46). Fig. 5: Both interpretation drawings overlaid. The aerial cropmarks and geophysical data suggests the site was square or rectangular in shape, this cannot be ascertained for certain due to the land lost on the southern side, however it appears more square in shape at present. This may suggest that this is not a moated site as they tend to be rectilinear or trapezoidal in shape (Barry 1987, 94). An example for comparison is that of the nearest moated site to the study site, Kilmacannon Moated site, situated only three kilometres away to the north-west. It appears to have a different morphology, and the lack of bastion corners or extended corners is particularly evident. The size is also noticeably different, it is long and narrow, rather than square, and much smaller with an internal area of only 500 square metres. Though without accurate knowledge of how much land was lost it is still possible that the site at Doonfore was more rectilinear than it appears today. 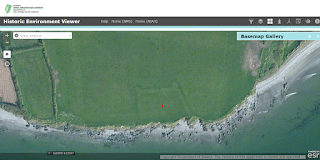 The corners of the site at Doonfore are also very useful in trying to define the site type. Unfortunately they were obscured somewhat by ferrous material in the magnetic gradiometer survey, but the earth resistance picked up the corners of the bank, seen as sub-angular in morphology. These may have been disturbed by the demolition of the site, and may not have retained their original morphology. The author believes the corners may have originally been angular in shape. Thus the corners may represent angular bastions. There are a few examples of moated sites with evidence for extended corners or bastions as already mention, but they are a normal characteristic of bastion forts (Kerrigan 1980, 40). Other reasons that would suggest this is a bastion fort are its strategic location. The site has commanding views of Sligo bay to the south-east, south and south-west (Fig. 6 and 7). Fig. 6: Panoramic view from the north-east bastion of the site, looking south-east (Photo by author). Fig. 7: View to the south-west from the site (Photo by author). This strategic element is also rather unusual for a moated site, there are a few examples in upland areas (Barry 2003, 182-184), but none to date have been found in such situations as this one, though further research on this is necessary. In the authors’ opinion, the geophysical results, morphology of the site as well as its strategic location all point to defining the site as a bastion fort. Land-ownership and possible dating of the fort. The study site area is known to have been under the control of the Gaelic-Irish during the thirteenth to fourteenth centuries, at the time moated sites were being constructed (O’Rorke 1890, 52). O’Conor’s (1997, 13) research has shown that the Gaelic-Irish did build moated sites, but fixed fortifications were often a disadvantage to the Gaelic-Irish as they utilised the natural landscape for their defence (O’Conor 2002, 79). In the 1600s the ownership changed from the Gaelic-Irish into the hands of Sir George Radcliffe, he purchased the land from the O’Conors, though when he had to flee to France the rebels regained the land (Thrush and Ferris 2010). However, his son was re-granted the land in 1660, and held it until 1670 when he died (Thrush and Ferris 2010). The author believes that the fort may have been built during the time between 1660 and 1670, which would coincide with the time that Bellaghy fort, in south County Sligo was constructed in 1659 (O’Dowd 1991, 131). O’Dowd (1991, 131) also mentioned prior to this that two forts were planned for the Carbury coast, and this fort would fit the geographical location. It is also likely that the fort went out of use after the battle of the Boyne in 1690 or perhaps earlier. The landowner between 1670 and the Gore family being granted the land around the early 1700s is unknown, and thus it is hard to say for certain when the fort would have been abandoned. The land was in the possession of the Gore and subsequently Gore-Booths up until the 1970’s when the Land Commission split up the land and granted it to local tenants. This piece of land was granted to Mr Michael Mitchell, father of the current land owner, Mr Liam Mitchell. Comparison with other bastion forts in County Sligo. Other bastion forts in County Sligo were measured for comparison with the fort at Doonfore. The smallest fort measured was that of Coney Island, it is 248.2m2 in overall area and its banks varied from 11.8 to 13.3 metres. The small nature of the site is perhaps due the engineers taking advantage of its location, as it appears to be perched on a small peninsula, on a slight platform (Fig. 8). Fig. 8: Coney Island fort, on a platformed peninsula. The bastion fort at Doonfore best fits the size of the Greenfort in Sligo, which measures 32.7 metres to 35.7 metres in bank length and 1,729m2 in internal area. The Greenfort was a major fort which was used and re-used over many years and played a very strategic role overlooking the fording point of the Garavogue river, a major pass between Connacht and Ulster (Simms 2003, 174-176). Even within Sligo as evidenced by the measurements of the bastion forts, there are visible differences in size and shape of the forts. Kerrigan (1980, 4) discusses the standard dimensions of bastion forts in Ireland, however through this minimal research, it can be seen that there are differences even within the County of Sligo. The size and scale may have also been dependent on the topographic suitability, available expenditure, raw materials etc (O’Sullivan and Breen 2007, 213), this may be the more likely reason for differences between the bastion forts. The bastion fort at Doonfore is very similar in size to that of the Greenfort in Sligo, and may have been even larger with the land that has been lost, thus this site must have played an important role in the defense of Sligo. The author has shown that this fort was considerable in size compared to many of the other forts in Sligo. The site may have had many functions in its macro-landscape. In the authors’ opinion, this fort was intended to alert the fort at Coney Island of the approach of ships, similar to the function of a signal tower (Kerrigan 1995, 276). The fort at Coney was blind to incoming ships until they were very close due to its location, however this may have been strategic, as the incoming ships would not have seen it either, and may have been happy to avoid the impressive fort at Doonfore and head for Sligo, where they would be attacked by surprise. The fort at Doonfore is located overlooking the exit of the Drumcliffe river into Sligo bay, perhaps the fort was protecting Drumcliffe, and one of the main fording points of the Drumcliffe river which was vital for access to Sligo town. It is also possible that there was a small port beside the fort at Johnsport, this port is possibly denoted on the Historic Six Inch map (Fig. 9). Fig. 9: Possible harbour denoted on the Historic Six Inch map (NMS). As well as this, the channel of the Drumcliffe river is constantly changing course where it exits into Sligo bay. Today only small boats can access the area near the site at full tide, and at low tide the beach extends out into Sligo bay. However, in the recent past the channel in which the Drumcliff and Carney rivers enter Sligo bay has moved. This is evidenced on the historic maps (Fig. 10 and 11), compared to recent aerial imagery (Fig. 12). Perhaps this may have also had an effect on the coastline, with deeper water nearer the coast. In the authors opinion the channel may have been quite close to the shore near the site at the time of its use, with deep enough water for ships to pass by at close range. Fig. 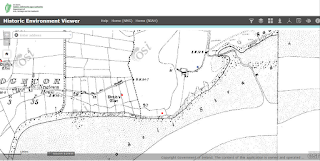 10 Cassini 6 Inch map showing channel near to the site (www.archaeology.ie). Fig. 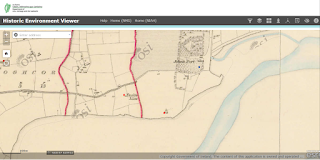 11: Historic 6 Inch map showing channel running nearby to the site (www.archaeology.ie). Fig. 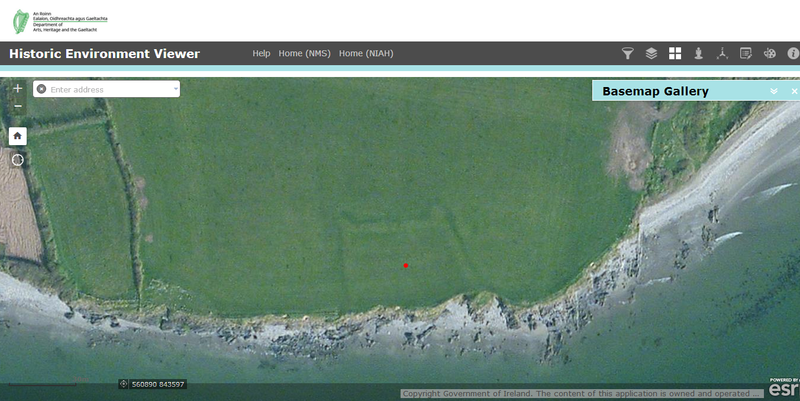 12: Latest aerial imagery Digital Globe, showing the channel well away from site (red circle) (www.archaeology.ie). 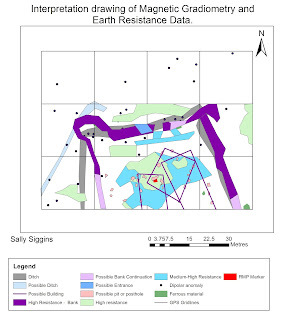 Within the sites micro-landscape, a number of internal features were recorded in the geophysical data, these included pits/postholes and linear features which may indicate buildings detected in the magnetic gradiometer data, and possible masonry buildings picked up the in the earth resistance data. The pits/postholes may represent timber buildings, these are mentioned in relation to Irish bastion forts, as possible temporary garrisons for housing the troops (Kerrigan 1980, 147). The possible masonry building in the middle of the fort, denoted as an area of high resistance in the earth resistance data may be related to a magazine or artillery store, these needed to be protected as gun powder, and other artillery materials were flammable or often explosive (Chartrand 2013, 45). Some magazines however were located in the bastions themselves (Chartrand 2013, 45), and due to the demolished nature of the bastions at Doonfore, two lost completely, and the two extant having been bulldozed makes the possibility of detecting buildings in them extremely difficult. 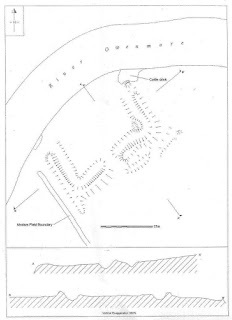 Other buildings which may have been located in the interior of the fort, or in the bastions include: commanders quarters, stores, garrisons quarters, blacksmith, kitchen, latrines, platforms, hospital etc (Chartrand 2013, 45). The large area of high resistance in the centre of the fort is likely rubble, perhaps consisting of a building, but also possibly some parts of the banks masonry which was bulldozed. This may also be hiding other features underneath, which are blocked by the masonry rubble. These buildings may have been any of the possible buildings mentioned previously. Coastal Regression Analysis and Land-lost estimates. Currently the two southern bastions are missing, presumed eroded by the sea. 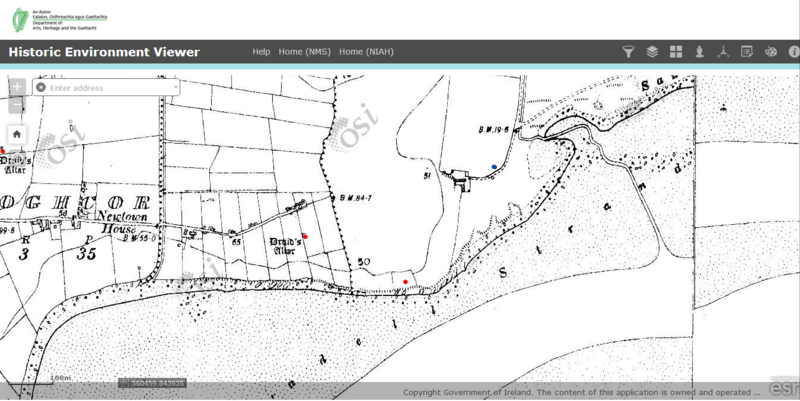 The regression analysis, an attempt at finding out how much land has eroded since the construction of the site, by digitally measuring the difference between coastlines on georeferenced maps was unsuccessful using two of the three historic maps available on www.archaeology.ie (Fig. 13). However, using the Historic Six Inch map the analysis was successful. The results showed that an average of 6.73 metres has been lost to the sea since the original six inch map was made in 1846. That is approximately 0.04 centimetres of erosion per year. The author believes that the site was built around 1660 and thus that would mean approximately fourteen metres has been eroded since the construction of the fort. This in the authors view would have allowed the fort to be whole at the time of construction. A photographic survey was also conducted along the stretch of coastline the site is located on. From the survey active erosion happening along the coastline of the site could be seen, with many areas bare of vegetation and showing recent soil collapse (Fig. 14). The authors own monitoring of the coastline has seen erosion in action along this stretch of coastline. The author also questions whether cannon fire from boats may have impacted the cliff face over the years in which the fort was in use, and whether this may have been a contributing factor to the erosion of the cliff and the fort, and as already stated there may have been deeper water located closer to the shore at this time. Fig. 14: Erosion and soil collapse along the exposed interior area of the fort (Photo by author). Through the photographic survey, possible elements of the eroding fort were recorded in the cliff section, these included the eastern bank and ditch (Fig. 15 and 16). These are possibly being protected due to being situated on a protruding piece of bedrock, which is holding the land in place, however directly to the west and east of the protruding piece of land is active erosion. 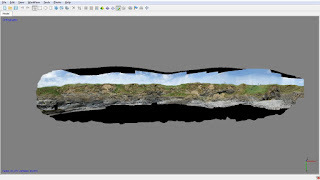 The photographic survey photos were uploaded to a photogrammatic software which produced a 3D model of the coastline (Fig. 17). The resulting model was quite low resolution as a much higher powered computer and bigger storage is needed to make high resolution models. However, it is still a record of the coastline, which when repeated could reveal new erosion, or land lost. Fig. 15: Erosion to the west of the protruding bank and ditch (Photo by author). Fig. 16: Erosion to the east of the protruding bank and ditch. (Photo by author). Fig. 17: Photogrammatic 3D Model. Due to the time limits of this project many other archaeological investigations were not undertaken, but the author would recommend further research to gain a better understanding of the site in its micro-landscape and in its macro-landscape. In conclusion, a site which for a period of time was forgotten about has been given life again through this research. Each part of this project has added new information about the site, which adds to its overall understanding and its contribution to the wider knowledge of sites of this nature in Ireland. The author believes that this site is a bastion fort, built some time around 1660-1670 while the land was in possession of the Radcliffe family, and perhaps fell out of use before 1690 and the Battle of the Boyne. Its main function was perhaps to warn Coney Fort and subsequently Sligo town Greenfort of incoming attackers and more locally to protect the fording point of the Drumcliffe river. The site is at risk of coastal erosion and ongoing monitoring of the site is necessary to prevent he loss of archaeological knowledge about the site. There are endless opportunities for further research on this site, not least the possibility of excavation. Although the site may be less than 450 years old, it had been completely forgotten about in the oral tradition of the area and in the history of Sligo until now, where it has been brought back to life. I have mentioned some people who were of great help to me during this project but I would like to again thank Dr. Fiona Beglane, Dr. James Bonsall, my volunteer survey team who took time out of their own studies to help me, and finally my family for getting me through the four year course and helping me in any way they could. In my thesis there is a full page of acknowledgements which I will not go into here, but a big thank you to everyone else who helped me in anyway. Also thank you to Dr. Thomas Nelligan for asking me to be a guest blogger. Barry, T.B. (1987) The Archaeology of Medieval Ireland. London, Routledge. Barry, T. (2003) “The defensive nature of Irish Moated Sites.” In. Kenyon, J.R. and O’Conor, K. eds. The Medieval Castle in Ireland and Wales. Dublin, Four Courts Press. 182-193. 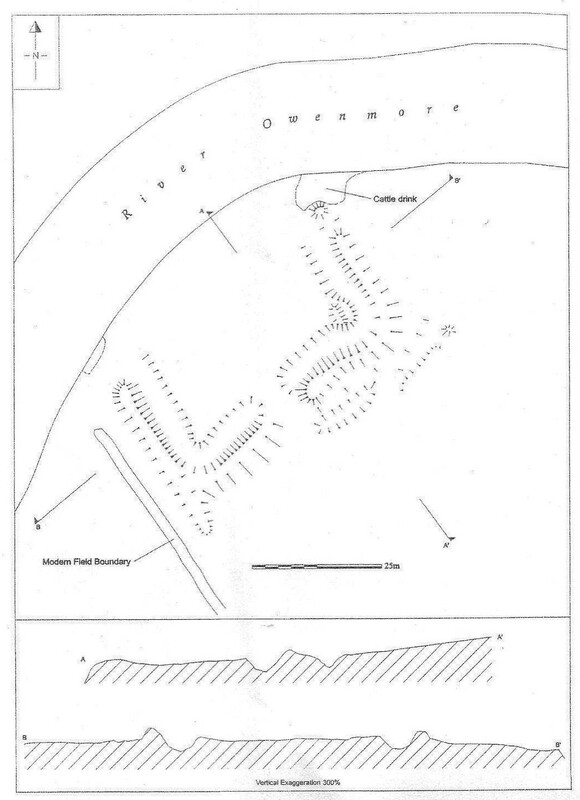 Chartrand, R. (2013) The Forts of New France in North-east America 1600-1763. Oxford, Osprey Publishing. Kerrigan, P. M. (1980) “Seventeenth century fortifications, forts and garrisons in Ireland: a preliminary list.” The Irish Sword, 14: 3-24. Kerrigan, P. M. (1995) Castles and Fortifications in Ireland 1485-1945. Cork, The Collins Press. O’Conor, K. (1997) “The Discovery Programme’s recent research on Medieval Rural Settlement in Ireland.” Medieval Settlement Research Group. Annual Publication 12: 10-15. O’Conor, K. (2000) “The Ethnicity of Irish Moated sites.” Ruralia, 3: 92-102. O’Dowd, M (1991) Power, Politics and Land: Early Modern Sligo 1568-1688. Belfast, Institute of Irish Studies. O’Rorke, T. (1890) The History of Sligo: Town and County – Volume 1. O’Sullivan, A. and Breen, C. (2007) Maritime Ireland: An Archaeology of Coastal Communities. Glouchester, The History Press. O’Sullivan, M. and Downey, L. (2006) “Moated Sites.” Archaeology Ireland, 20(4): 34-36. Schmidt, A., Linford, P., Linford, N., David, A., Gaffney, C., Sarris, A. and Fassbinder, J. (2015) EAC Guidelines for the use of Geophysics in Archaeology. Hungary, Archaeolingua. Simms, J. G. (2003) War and Politics in Ireland, 1649-1730. Edinburgh, A & C Black. Thrush, A. and Ferris, J. P. (eds.) (2010) History of Parliament: The History of Commons 1604 to 1629. Cambridge, Cambridge University Press. Sally has just recently completed her BSc (Hons) Applied Archaeology degree at IT Sligo. She is involved in The MASC (Monitoring the Archaeology of Sligo’s Coastline) Project which is run by directors Sam Moore and Dr James Bonsall, as well as this Sally is a regular volunteer on other small community projects. She is an amateur photographer, and is currently working on the home farm in North Sligo. She is currently working with the IAC in Roscommon. We are very grateful for her contribution. This is a really impressive piece of work. It demonstrates the level of research that is possible through the passion for history and archaeology. I am just about to start the HNC archaeology course at Sligo as a (very) mature student, and I share the the same passion (almost addiction!) for the past.